SACO — Andrew and Dylan Smith have had success as two of Maine’s top high school long jumpers. And many who know the twins, juniors at Thornton Academy, might say their success is due to their dad: Thornton assistant coach and former University of Maine All-American Carl Smith. But that’s not how Carl Smith sees it. “I want them to each be their own person,” Smith said while coaching Thornton’s jumpers at a recent practice. The Smith twins will pursue individual and team track and field titles over the next two weeks. They say their father is someone they listen to and learn from, and a guy who’s good at stepping out of the spotlight, even when he shares it with them. The identical twins will compete Saturday with the Trojans at the Southwestern championships at Scarborough High. Also on Saturday, the Western Maine Conference championships will take place at Lake Region High in Naples. On June 7, state track and field meets will be held at Windham for Class A, Brewer for Class B and Foxcroft Academy for Class C.
Dylan placed fourth at the Class A indoor state meet in February and leads Class A long jumpers this spring with a mark of 20 feet, 10.5 inches. He could win the state meet, according to Thornton Coach George Mendros. Andrew Smith is coming off a pulled hamstring after soaring to 21-1 indoors. He won’t jump this spring. He will compete on the Trojans’ 400-meter relay team. But his fourth-place finish at the Class A state outdoor meet last year was an impressive feat for a sophomore, Mendros said. He, too, could someday win a Class A state title in the long jump. Their father had a notable career as a two-time high school All-American sprinter at Riverhead High in Riverhead, New York. For more than 20 years, Carl Smith held the state record in the 100 meters at 10.3 seconds, according to the New York State Public High School Athletic Association. And 22 years after graduating from the University of Maine, Carl Smith still shares the 100-meter school record (10.58), although he is best known for his football career as a running back. That career, which spanned from 1988-91, left Smith with nine school records that still stand, including the single-season rushing mark of 1,680 yards set in 1989. 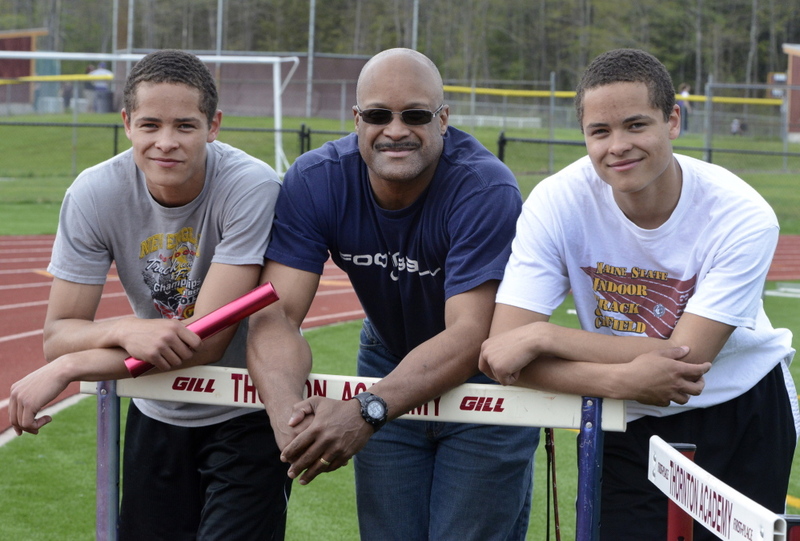 But with his boys, the Thornton Academy jumping coach emphasizes he’s their dad first. So he hangs back at meets when they compete. Smith, who started coaching in 2001, said he left the team for two years while his sons were in middle school. Today, with each Thornton Academy jumper, Carl Smith celebrates small victories. “Every time one of my (students) comes down this runway, I want them to have a good jump,” he said. Mendros said while Smith has coached several top finishers at the state meet, the biggest thing he brings to the program is an understanding of what it takes to be a champion. Smith hands out encouragement in the same vein to athletes who are long-jump state champions, such as Thornton junior Tori Daigle, as he does to those who never have qualified for the state meet. His sons say he coaches them well, then steps aside. The Smith twins like having their father as their coach. The say the former high school All-American who soared to 22-11 in his day is a positive source of inspiration, even though he never talks of his own glory days.